Summer Deluxe Portable Booster Seat 40% Off! Amazon currently has the Summer Deluxe Booster Seat 40% Off! It comes in Tan or Pink print and has great reviews. Fisher-Price Disney Ariel and Flounder Playset 50% off! The adorable Fisher-Price Little People Disney Princess Ariel and Flounder Playset is currently 50% OFF! It has a 4.5 out of 5 Star Rating too. 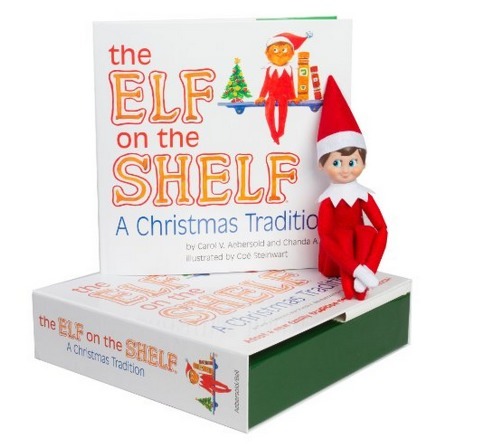 *HOT* Elf on the Shelf Book + Boy or Girl Elf 33% OFF! WOW! Amazon is offering a RARE sale price on The Elf on the Shelf Book + Girl Elf and the The Elf on the Shelf Book + Boy Elf they are currently both 33% Off! These hardly ever go on sale, so I recommend ordering now while the price is low and storing it away for next Christmas. We started this tradition last year and it was SO much fun!! *Remember Amazon prices can change at any time. TODAY ONLY Amazon is offering The Godfather Collection (The Coppola Restoration) that includes ALL 3 Godfather movies for just $16.99 (reg. $57.99!). *Remember Amazon pricing and promotions can change at anytime, so snag this hot deal now! The Polar Express Hardcover Book + Ornament + CD 53% OFF! WOW! Amazon has the 25th Anniversary Edition of The Polar Express Book + Ornament + Bonus CD 53% OFF! Just in time for Valentine’s Day, Men’s Stuhrling Watches are 85% OFF + FREE Super Saver Shipping! BONUS: Use promo code RETMEN25 at checkout on the Stuhrling Original Men’s 858R.01 “Concorso Silhouette Sport” Watch to get an additional 25% Off that watch. These super low prices are available TODAY ONLY so be sure to order now before the price jumps back up. TODAY ONLY: FREE Redbox Movie Rental! YAY! Today Only (1/30) Redbox is offering a FREE 1-day DVD rental! Code is only valid on January 30th, 2014 until 11:59pm. My Little Pony Princess Twilight 63% OFF! Hurry to snag the very highly rated My Little Pony Feature Princess Twilight Sparkle 63% OFF! Allergy Relief Body Pillow is 67% Off! Aller-Ease products are designed to block out allergens that commonly trigger symptoms. Get comfortable with this Aller-Ease body pillow while protecting yourself from allergens that commonly trigger symptoms. 100% cotton cover with hypoallergenic fiber fill. Allergy proof fabric blocks out microscopic particles that can trigger allergies and asthma. Pollen and pet dander barrier. Backed by Good Housekeeping Seal’s 2 year warranty. Machine wash warm, non-chlorine bleach when needed. Tumble dry low.